Deep convection has been looking impressive for the past few days in the northeastern Caribbean. An upper air trough north of the Caribbean coupled with a tropical wave appears to have organized the convection last night. 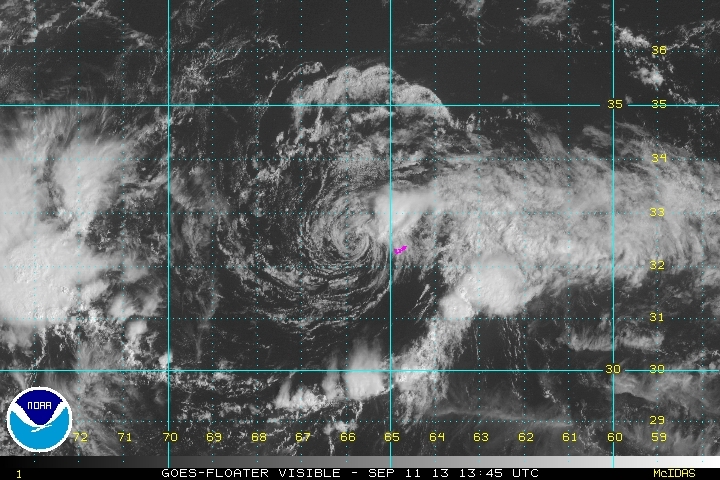 NHC named Gabrielle last night as the IR satellite imagery showed an impressive circular structure of convection. This morning convection is collapsing near Puerto Rico and surface wind observations show little to support a 40 mph tropical storm. I do not believe that the circulation center is near the official location stated below. IMO, this feature is still a tropical depression and may become a storm north of Puerto Rico as some models suggest. A reconnaissance aircraft will investigate later this morning so a much better understanding of this feature with be obtained. 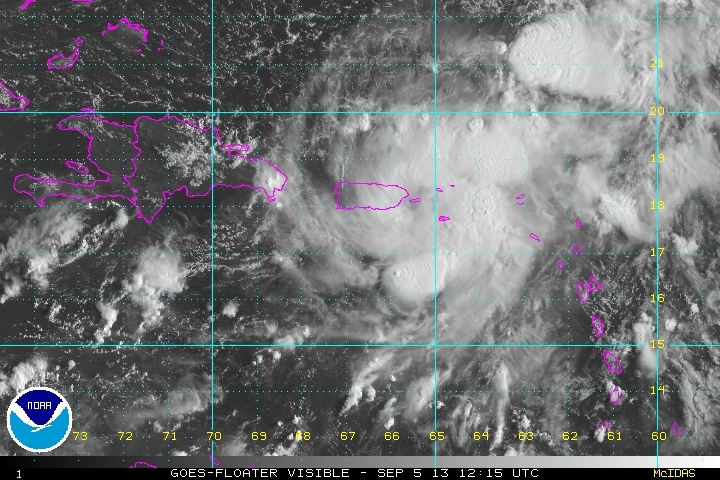 As of 8 am ast (edt) Gabrielle was centered at 17.7 N / 67.4 W or about 65 miles wsw of the Ponce, PR. It was moving northwest at 8 mph. Top sustained winds estimated at 30 mph (40 mph NHC 8 am advisory). Pressure was estimated at 1008 mb. Forecast models take Gabrielle northwest east of the Bahamas. The GFS model drifts it toward the Southeast coast several days from now then moves it out to sea with a cold front. Another model dissipates Gabrielle north of the Caribbean. NHC downgraded at 11am to tropical depression. Gabrielle passed west of Bermuda yesterday. Top sustained winds were 40 mph or minimal tropical storm strength. After being badly sheared by upper air winds, it is now regaining strength. 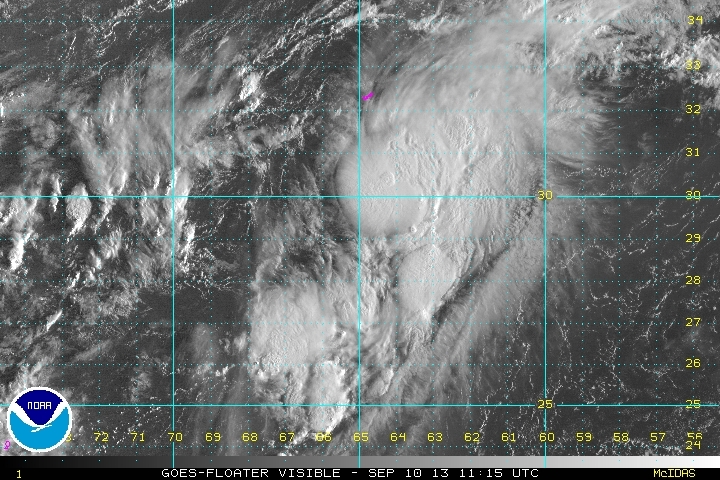 It is likely that Gabrielle will be upgraded to tropical storm strength later today. On Bermuda, winds are weakening now to about 15-20 mph with rain showers. 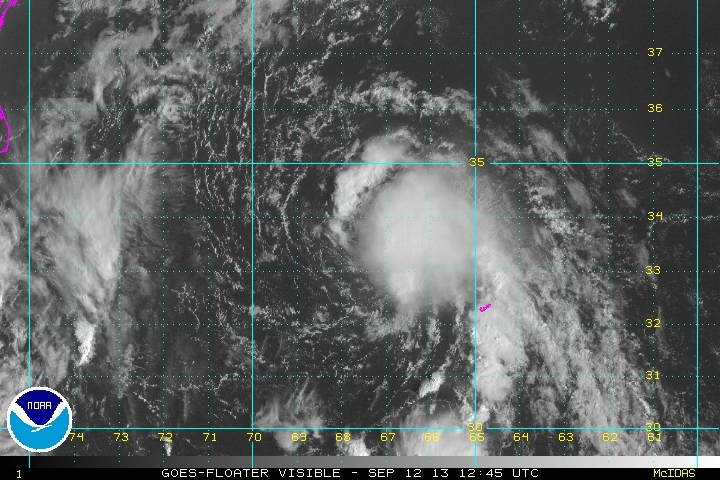 As of 5 am ast (edt) Gabrielle was centered at 33.5 N / 67.7 W or about 190 WNW of Bermuda. It was moving northwest at 7 mph. Top sustained winds estimated at 40 mph (35 mph NHC 5 am advisory). Pressure was estimated at 1010 mb. Forecast models take Gabrielle north toward Nova Scotia by late Friday night / early Saturday morning It is expected to stay at tropical storm strength upon landfall. As expected Gabrielle was upgraded to tropical storm strength (40 mph) at 11am. Gabrielle has been downgraded to a depression and is losing its tropical characteristics It is merging with a front moving into it from the west. It is picking up speed. 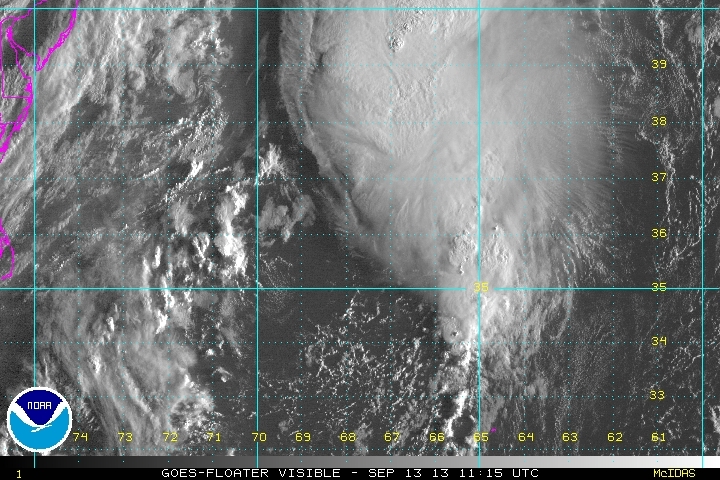 As of 5 am ast (edt) Gabrielle was centered at 36.5 N / 67.5 W or about 595 SSW of Halifax, Nova Scotia. It was moving NNE at 17 mph. Top sustained winds estimated at 35 mph (35 mph NHC 5 am advisory). Pressure was estimated at 1007 mb.